There are certain things you can always count on as soon as the leaves start to change colors. Some people get excited about football, others picking apples and pumpkins. I love all those things too, but the one sure thing that always falls on the first weekend in October is Taste of Bethesda. The organizers have been incredibly lucky with great weather the last few years, and this year was no exception. You have to know what you’re getting into when you head towards the Woodmont Triangle area. If you have an aversion to large crowds, dogs, strollers, music, and narrow spaces, this event isn’t for you. If you can ignore all that and just focus on the fun atmosphere and a chance to have great food with friends, then it is a really great event. You have to tackle the Taste with a strategy and you can’t just give your tickets to the first booth you see. We grabbed a map and walked up and down each street. Brett got a slider at Fresh Grill since we’ve wanted to try that place for awhile. I had a bite and agreed with him that we will definitely have to check out the place in the near future. We stopped in front of the restaurant to eat away from the crowds and noticed a sign that said Happy Hour from 4pm to 7pm, another sign for a winner in our book. Moving along, I noticed the Original Pancake House was serving their signature crepes, either with lemon or Nutella fillings. I always love the idea of ordering crepes when we eat brunch there, but a whole plate of them is too many for me, so getting one crepe for three tickets seemed like a great compromise. 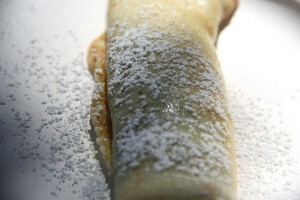 The crepe was light and fluffy right off the outdoor grill, with the warm Nutella oozing out. I guess technically that means I started off with dessert, but I suppose there is nothing wrong with that, right? Next, we got the bigger parts of our feast, with Brett having BBQ at Nest and I opting for the grilled lamb chops at The Oz. 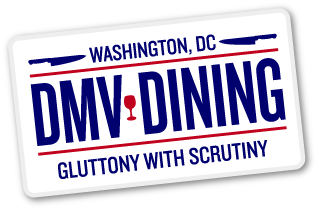 One of the great things about Taste of Bethesda is that it provides exposure to restaurants that people may not be aware of. Brett and I have been to The Oz several times and feel it is definitely underrated. After this weekend, I think that might have changed for anyone who waited in their line. 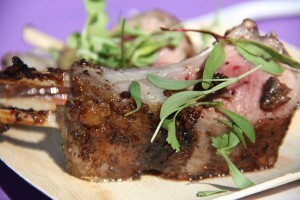 I was debating between the lamb chops and the BBQ duck salad, which looked great as well. But I will definitely say that the lamb chops may have been the best deal of the day. For four tickets, you got a full plate of four chops, grilled to perfection on the spot with spices and herbs sprinkled on top. It was certainly heavy and pretty much did me in for the rest of the afternoon, but it was worth it. After that I wasn’t sure what else to get, so when Brett wanted to share a falafel at our new favorite Greek spot, Yamas Grill, I happily gave him my ticket. I only had a few bites but the falafel seemed really moist and I would definitely get a full order of it when we go there next. 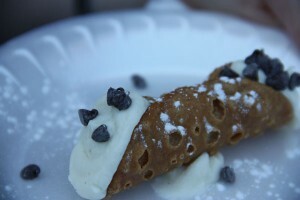 Finally, I had to get our go-to pastry at this annual event, the cannoli at Olazzo. 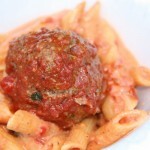 For two tickets, it is hands down one of the best desserts, and yet another reason to visit this reliable Italian restaurant. Then of course we had to go back to The Oz and wait in line while a friend got the lamb chops I recommended, and over an hour later the line was even longer than before, but amazingly they hadn’t sold out of them yet! Albie starting with dessert? Yeah, that sounds about right. Haha I still remember Dave yelling at me when I would do that at Da Lunch Table! Was that freshman year?